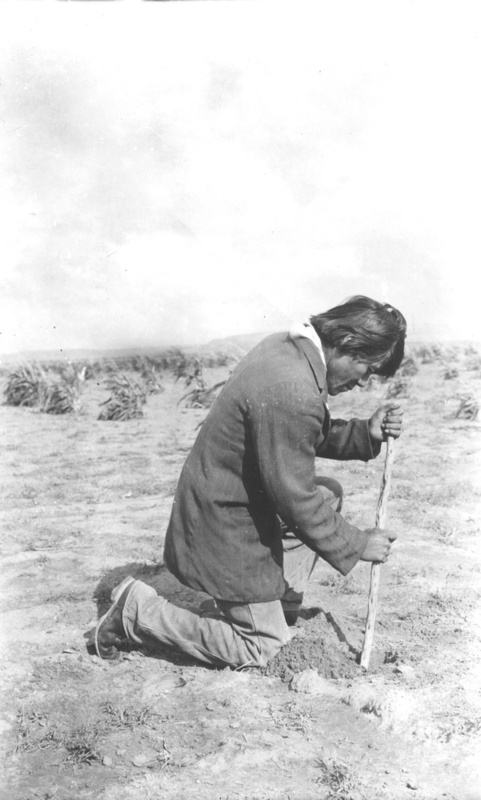 Hopi boy planting corn at Polacca, Arizona, 1918. The oldest known corn pollen is scarcely distinguishable from modern corn pollen, judging by an 80,000-year-old fossil found 200 feet below Mexico City. The oldest ears of popcorn ever found were discovered in the Bat Cave of west central New Mexico in 1948 and 1950. Ranging from smaller than a penny to about 2 inches, the oldest Bat Cave ears are about 5,600 years old. In tombs on the east coast of Peru, researchers have found grains of popcorn perhaps 1,000 years old. These grains have been so well-preserved that they will still pop. In southwestern Utah, a 1,000-year-old popped kernel of popcorn was found in a dry cave inhabited by predecessors of the Pueblo Indians.